Brenda Kee's silk ribbon embroidery stopped me in my tracks as I scouted around the interwebs while Christmas shopping. bstudio is the newest sponsor here on the blog, and I'm delighted to have the opportunity to introduce her elegant greeting cards, pillows, jewelry, sachets, and wedding items to you. I love the way Brenda's shop is arranged by color. With Valentine's Day on the horizon, you'll easily find all sorts of pink and red lovelies to give as little gifts. 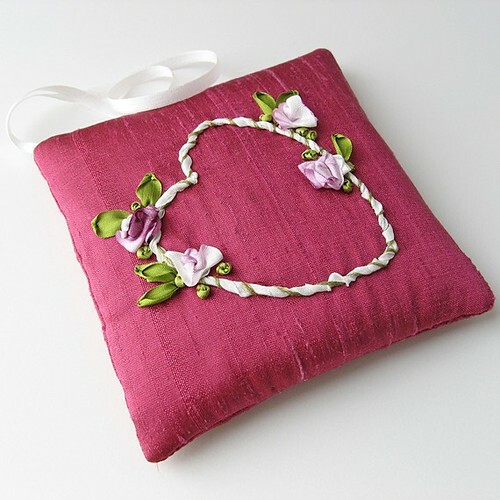 It's probably safe to say silk ribbon embroidery is something that appeals to those of us who love fine handwork, whether it's done with paper or fabric. 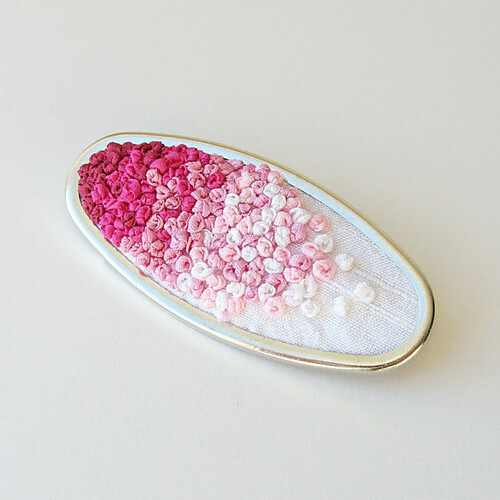 I admire Brenda for modernizing the art with her stylish designs.... this French knot ombré brooch on dupioni silk, for example - wow! 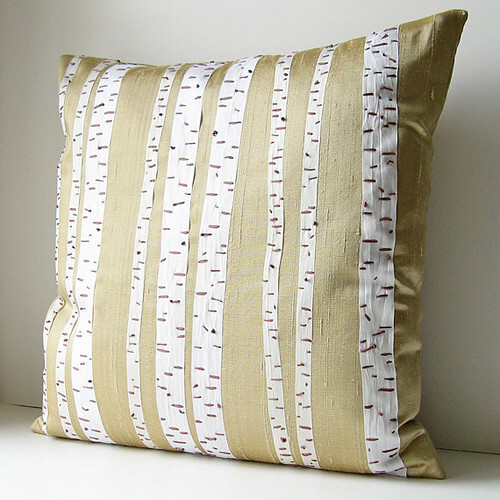 Originally Brenda was a commercial interior designer in Toronto, Canada, but now she and her husband live in the countryside where she appreciates every moment of her artisan lifestyle, a joy that's reflected in the beauty of her nature-inspired creations. 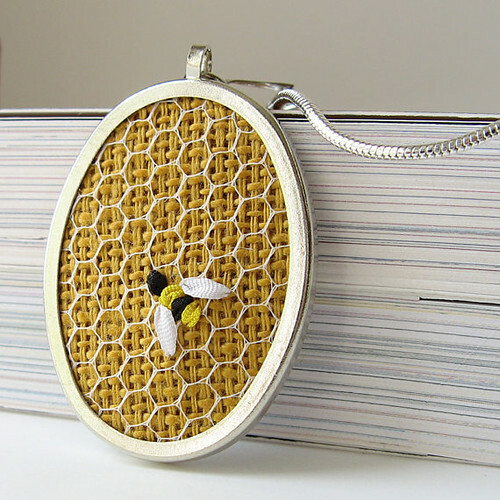 My mind is already turning toward spring, summer, and the great outdoors... and warm thoughts intensified when I spotted bstudio's dear nest ring, birch tree pillow, and honeybee necklace! Brenda is offering a coupon code exclusively for All Things Paper readers to use from January 18 until January 31, 2012. The code is 'BEMINE10' for 10% off any bstudio order before shipping. Lovely work and very affordable. 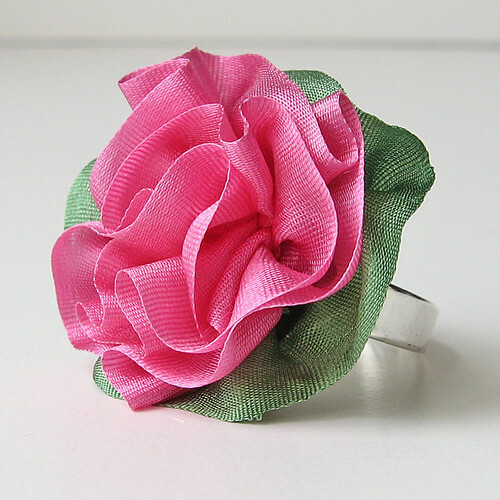 i'm in love with that flower ring! and the bumblebee! so cute. Thank you for the wonderful feature about my work! I have had the pleasure of buying a few items from bstudio and each and everyone is as special and beautifully handcrafted! 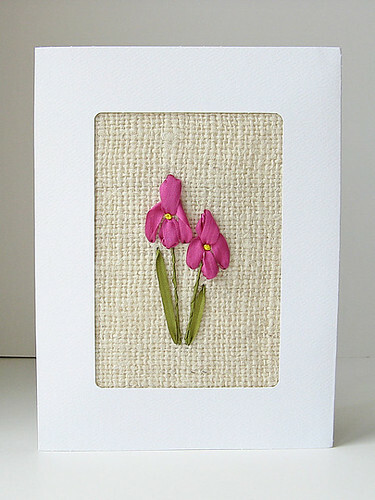 I've come to know Brenda through her book "Ribbon Art" which is a great step by step book for people who love needlework! So you can imagine how happy I was to find her shop on Etsy! jdartstudio, I'm so glad you mentioned that Brenda has written a book - I didn't know that! Just found it on Amazon and it looks lovely. gorgeous! thanks so much for introducing. i just bought the bee necklace! So pretty! Always wanted to embroider poinsettias with organza ribbon on a table runner. ha, this is where my sis (sylvia) found her new necklace! i was in our joint etsy account and was wondering where in the world she found this awesome bee hive necklace. 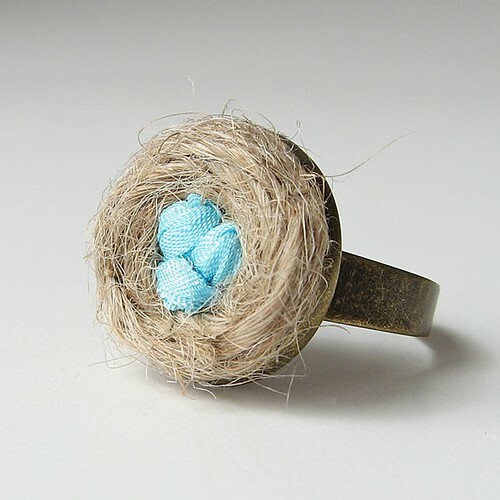 the other items are beautiful as well, the nest ring is another favorite. The birds nest ring is my favourite. All her work look beautiful!! Thank you for featuring this wonderful artist, everything was just so beautiful.